Gingerbread cookies: Not everyone is smiling. St. Louis might be the "America's Most Dangerous City," but for the sellers of vegan baked goods, the place not to be is apparently Chelsea Market in New York City. 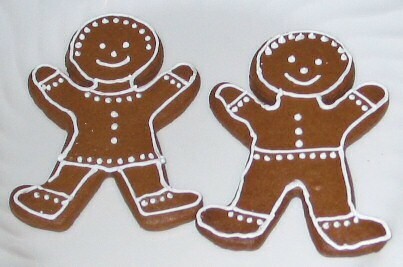 The New York Post reports on a woman caught twice in the act of stealing vegan, organic gingerbread cookies. The article describes the thief as "well-dressed" woman who drives a purple, foot-powered scooter. She has assaulted the manager of the store twice, once with Mace, once with the aforementioned scooter. "F- - - you! I'll be back every day! You can count on it!" the woman allegedly screamed at One Lucky Duck manager Jonathan Wright after he accused her last Wednesday of stealing cookies. Why so angry? I'd make a crack about being driven mad by a vegan diet, but after last week's review of SweetArt, I'm trying to make nice with our non-animal-product-using friends.